Support for this gimbal is included in Copter 3.4 (and higher). The SimpleBGC controller and accompanying 2-axis and 3-axis gimbals can be purchased from basecamelectronics.com and many other retailers. Although the SimpleBGC can be connected using PWM (similar to the Tarot gimbal) we recommend using the serial interface connected to one of the flight controller’s Serial/Telemetry ports like Telem2 as shown above. However, if you connect the gimbal as shown in the above diagram it is NOT possible to establish a connection to the GUI on a PC via USB and have it connected simultaneously to the flight controller since the UART1 (“serial” in the picture above, present on “Regular”, “Extended” and “Tiny” controllers) is “paralleled to the onboard USB-UART converter (excepting the “Tiny” board that has a dedicated USB). Simultaneous operation of the GUI and the external IMU is not possible for that reason” (https://www.basecamelectronics.com/files/v3/SimpleBGC_32bit_manual_2_6x_eng.pdf). If you accidentially connect both the GUI via USB and a flight controller via UART1 you might end up with corrupt data on the flash of the gimbal. This can result in unexpected motor movement! In Ardupilot/APM Planner/Mission planner set the following variables: - MNT_TYPE to 4 / “Mount Type (None, Servo or MavLink)” - SERIAL2_PROTOCOL to 1 / “MavLink” (Notee “SERIAL2” should be “SERIAL1” if using Telem1 port, SERIAL4 if using Serial4/5, etc) - SR2_EXTRA1 to 20 - SR2_POSITION to 10 - SR2_RC_CHAN to 20 and all other SR2_* variables to 0. If you wish to control the pitch angle manually you can set - MNT_RC_IN_TILT to 6 - In the SimpleBCG GUI in the tab “RC Settings” in the field “Input Configuration” set PITCH to “API_VIRT_CH6”. Once powered the gimbal should point to it’s Tilt Angle Min (i.e. straight down) when your transmitter’s channel 6 tuning knob is at its minimum PWM value (perhaps around 1000) and the camera should point to its maximum tilt angle (i.e. straight forward) when the tuning knob is at its maximum (perhaps around 2000). The Mission Planner Radio calibration page can be used to check the Ch6’s current input PWM value. You must have GPS lock to test ROI. The ROI feature points the vehicle and/or camera to point at a target. 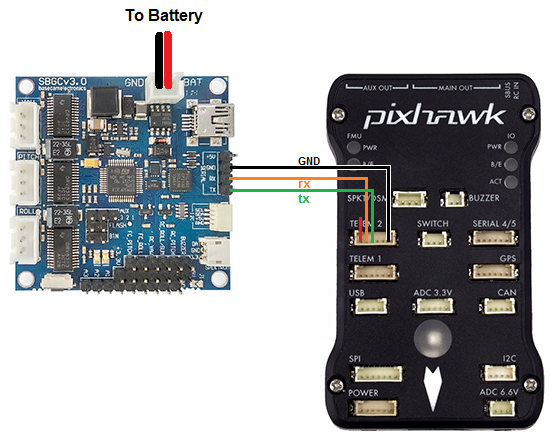 The instructions above describe setting up the APM/Pixhawk so that it only controls the Tilt (i.e. pitch) of the Tarot gimbal so when a Do-Set-ROI command is received Copter will attempt to turn the vehicle’s nose to point in the direction of the target and tilt camera depending upon the vehicle’s distance and altitude. 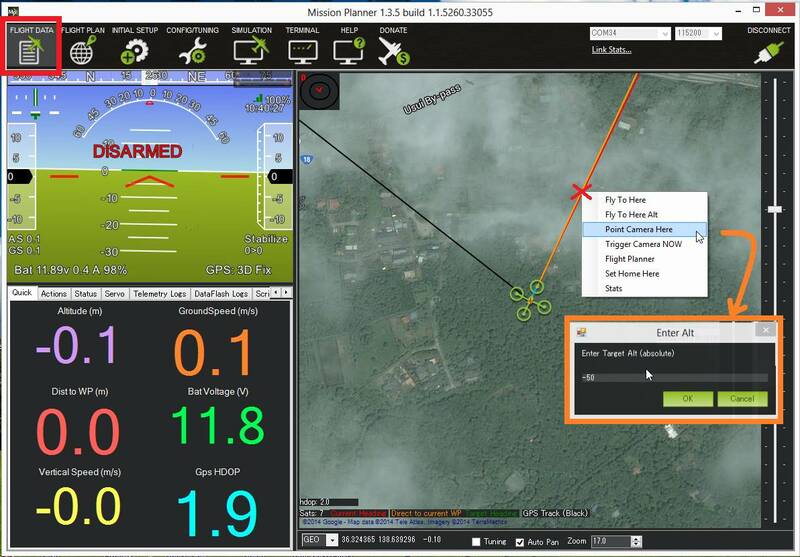 You can test the gimbal tilt moves correctly by connecting with the mission planner, then on the Flight Data screen’s map, right-mouse-button-click on a point about 50m ahead of the vehicle (the orange and red lines show the vehicle’s current heading), select Point Camera Here and input an altitude of -50 (meters). This should cause the gimbal to point down at about 45 degrees.